The European Union (EU) will spend about two billion euros on the expansion of the railway network in Azerbaijan, Belarus, Georgia, Moldova and Ukraine. This is an integral part of the expansion plan for the Trans-European Transport Network (TEN-T) project, Report informs citing foreign media. The total investment in railway and road projects linking these countries is estimated at 2.120 billion euros. At least 328 million euros has been allocated to work on signalling, telecommunications and electrification on the section passing through the territory of Azerbaijan from the border of Georgia to the Baku port. 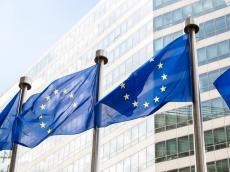 The European Commission (EC) and the World Bank have already submitted an Indicative Investment Action Plan in accordance with the priorities set out for these countries. Together, the projects in the Eastern Partnership countries will require an estimated investment of almost 13 billion euros and foresee a total of 4,800 kilometers of road and rail, 6 ports and 11 logistics centers. The priority investments include both short-term projects to be completed by 2020 and long-term projects aiming to improve transport links on the TEN-T by 2030. The projects in Azerbaijan, worth 1.1 billion euros, include creating five logistics centers (369 million euros) and a free trade zone in Alat (410 million euros) and modernization of the East-West Railway (328 million euros). The first two projects are proposed to be financed via public-private partnership and the third project by the international financial organizations. The projects will make possible the construction and rehabilitation of new and existing roads, rail, ports, airports, as well as logistics centers and border crossing points. The free economic zone is being created in the village of Alat on the basis of the presidential decree signed in March 2016. The territory of the new Baku International Sea Trade Port is also included in this zone. Presently, several routes from the East to Europe pass through the territory of Azerbaijan. International North-South Transport Corridor, which is designed to transport goods from India and the Persian Gulf countries to Russia, Western Europe, the Baltic and Scandinavian countries. In addition, the Baku-Tbilisi-Kars railway built at the initiative of Azerbaijan, which is part of the East-West Corridor, also allows supplying cargo to Europe. Another example is the Lapis Lazuli route, which runs from Afghanistan to Turkey and further to Europe. Azerbaijan and EU successfully cooperate in various fields, and these partnership relations are constantly developing. To date, important documents such as Partnership and Cooperation, Visa and Readmission Agreements, Action Plan under the European Neighborhood Policy and the Eastern Partnership Initiative that raised relations to a higher level have already been signed. The EU is the largest investor in Azerbaijan. There are more than 1,500 European companies in Azerbaijan. Over the past 11 years, EU member states have invested more than $ 20 billion in Azerbaijan, accounting for 46 percent of the total foreign direct investment in the country. Today, the EU is the largest foreign investor in the country's oil sector as well as in the non-oil sector. In 2012-2017, the EU invested $ 15.3 billion in Azerbaijan, accounting for 38.2 percent of the total investment in Azerbaijan's economy. The EU and Azerbaijan intend to agree on a draft strategic partnership agreement on cooperation until May 2019. The political and trade components of the agreement were discussed in early December 2018. The next round on the new agreement as a whole will be held in Brussels in late January 2019. The new agreement should replace the 1996 partnership and cooperation agreement and should better take account of the shared objectives and challenges the EU and Azerbaijan face today. The new agreement envisages the compliance of Azerbaijan’s legislation and procedures with the EU’s most important international trade norms and standards, which should lead to the improvement of Azerbaijani goods’ access to the EU markets. Azerbaijan and the EU will hold a high-level transport dialogue this month in Baku to discuss the cooperation issues in the field of transport. Azerbaijan, as the initiator and active participant of such large projects as Baku-Tbilisi-Ceyhan and the Southern Gas Corridor, is a strategic energy partner of the EU. The Southern Gas Corridor provides for the transportation of 10 billion cubic meters of Azerbaijani gas from the Shah Deniz field of Caspian region through Georgia and Turkey to Europe. The EU strongly supports the Southern Gas Corridor project, which is jointly implemented by Azerbaijan and its foreign partners, and interested in supplying Caspian hydrocarbon resources to Europe, as it comprehends diversification of the energy sources necessary to ensure Europe's energy security.